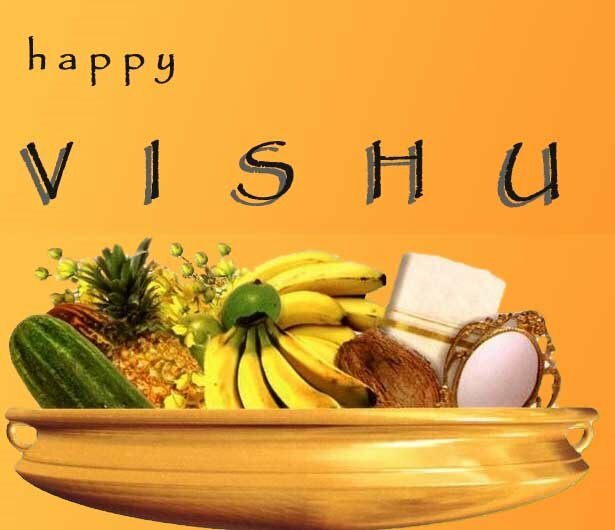 Today is Vishu, the festival of prosperity and hope, the festival that promises better tomorrows as days go by. The ‘Vishu kanni’ or the coiffured ‘Omen’ is the first thing seen in the morning as the first rays of sunlight touch the earth on the Vishu day. The Vishu kanni is arranged on a bronze platter whose glory tries to reflect that of the sun. Rice, Fresh fruits and vegetables, bunches of golden Laburnum flowers, a bronze mirror, a gold bordered piece of cloth and Collyrium, are all arranged as salutations offered to Lord Vishnu, the protector. Vishu has always been a much awaited day in my life since childhood. A Typical Vishu day starts with my mom waking up my brother and me reminding us ‘not to open our eyes’ (funny it might sound to those who’ve never celebrated Vishu). We are led to the Puja room with our eyes closed. And then, the opulence of the Kanni is silently revealed to us. As our eyes take their time to adjust to the radiance of the oil-lamp lit kanni, the elders give us money as a token of good fortune….the only day when kids are legitimately showered with cash. This is followed by fire works and a sumptuous lunch. On the eve of Vishu, our excitement would be to procure the ‘Konna Flowers’. Konna tree (Amaltas in Hindi, ‘Indian Laburnum’ in English, ‘Cassia fistula’ in Latin) is considered to symbolize Prosperity and happiness. Years back it was easy to procure the flowers since every other house had a laburnum tree. Now my parents along with millions of other malayalis feel the pinch of the changes triggered off by ‘development-gone-wrong’. 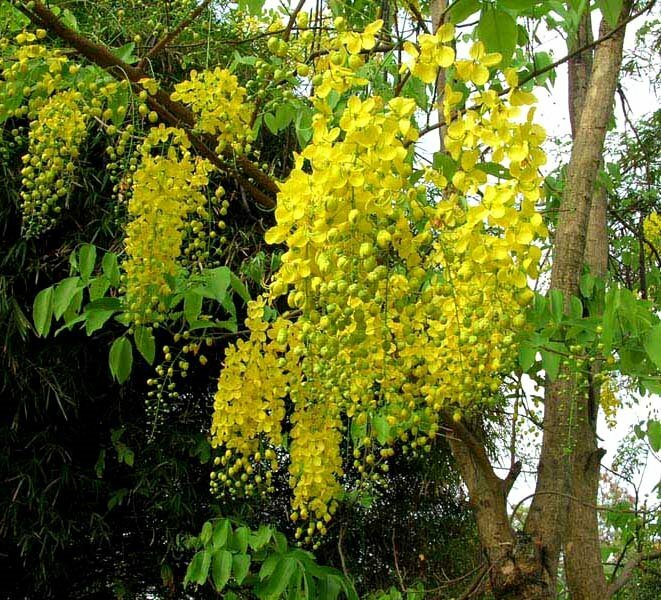 Firstly laburnum trees are hard to find in Kerala now-a-days. Secondly even if there are a few trees left….they refuse to flower during Vishu …almost like a silent indignant protest. The science fraternity claims this phenomenon of late flowering of Cassia as a product of the recent climatic changes due to global warming. This may be just one of the many irreversible shifts in the course of nature…many of which are not readily visible and hence conveniently left unnoticed. Yet…. year after year…. the cycle goes on…. 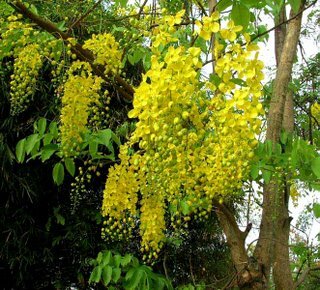 and millions of malayalis wait in vain for the laburnum to bloom in time so that they can auspicate another new year….. another year of fresh hope and good fortune. good sandip and a very happy new year. its nice to hear something ..... a relationship.... cultural attachment and i think you are missing a lot. but do remember that u can and should do a lot to kerala (atleast to your hometown)as a landscape architect.wish u all the best for your future. hey first of all happy vishu, wishing u and ur family a very prosperous year. really nice post sandeep- all landscape boy- and i love laburnum trees. theres one in my lane at home that i watch every year for signs of flowering. love the post.. specially the laburnums protesting part..lovely it sounds. Ya really missed you today .. And even you missed some money... LOL!! Such a lovely,hearty and sensitive blog.A quiet-flowing cascade of childhood memories.I thought you might not bother about the rituals and routines of festivals.Now I learn that these events are retained and cherished like jewels in ur mind.Congrats. I never thought u d read my blog...but am happy that u did. Keep the faith...and Keep Ur traditions alive and when the time comes...I wish Ur children waking up to same traditions and festivities as U do. you know sandeep laburnums have a special place in my childhood memories too....when i was a small child and used to go out on my small cylcle with my dad trailing along i used to stop under laburnums and enjoy the yellow dazzle against the setting sunlight. my dad used to pluck a few bunches and adorn my cylce handelbar with them! the laburnum yellow is the happiest colour for me.